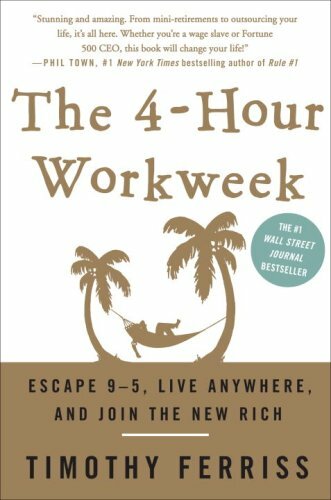 This past week I read, (well actually listened to) Tim Ferriss’ book, The 4-Hour Workweek: Escape 9-5, Live Anywhere, and Join the New Rich. I have been meaning to read this book for some time now and I finally had the chance to listen to the audio version on a road trip I took this weekend to Montreal, Canada. It took about 8 hours to listen to the whole book but that was 8 hours I would have been listening to pointless music for. Tim doesn’t claim that everyone can or should only work four hours per week but he does make very valid points about how people waste time when they could otherwise be more productive. For example, he suggests limiting your email checking. I for one have my outlook email set to send receive every minute, and I check my Gmail and Yahoo accounts pretty much just as often. I feel that I need to be on top of every email the second that it comes in so that I can be as productive as possible. Tim proves that this is a waste of time and completely counterproductive. If you batch your email checking into designated times, you will get things done a lot more efficiently and effectively. He suggests checking email twice daily at 12:00 PM and 4:00 PM to start out and then check less often as time goes on. Tim checks his email once a week for 2 hours on Monday mornings. He makes it possible by setting up auto responders with messages to the effect of “I will be checking my email (enter date, frequency or whatever) and will get back to you right away after that. If it is an emergency, call my cell at 555-555-5555.” People will come to accept this and will cooperate with your system. If you have a boss, tell them that you are more productive when you can get your work done without interruptions and you will still be checking email regularly. Instead of spreading your email out over an 8 hour workday, you can spend a fraction of the time taking care of your messages all together at designated times. Another point that Tim makes is that projects take you as long to do as the time you have allotted for them. He uses Parkinson’s Law, that “work expands so as to fill the time available for its completion” to show that you really don’t need as much time as you are using to get things done. Most people who work 9-5 don’t use their 40 hours per week as productively as they can. In fact, most people probably aren’t even productive half of the time. These people can probably deliver the same results in half the time. If that is so, why are so many people slaves to their jobs their whole lives? Tim likes to look for loopholes to work as little as possible and get the best results. When he was making cold sales calls, he discovered that the hardest part of getting through to decision makers is the gatekeepers or secretaries. He found that by calling for just half an hour before office hours and half an hour after office hours, he can be twice as productive as the people calling from 9-5. Tim doesn’t like to follow the system, he likes to beat the system and he proves it over and over again in his book.